The species Clivia nobilis (C.nobilis) has a wonderful drooping flower and is in our opinion undervalued in the genus. It’s slow growing nature is seen as a disadvantage by many commercial growers, however in full flower C. nobilis is an outstanding specimen plant. Considering that this was the very first clivia species discovered and it’s widespread use in the development of ‘interspecific hybrids’ it certainly is a valuable species. An ‘old fashioned’ plant found in established gardens in many older areas. With tubular flowers held in a bunch well above the foliage in a pendulous manner these are an easy to grow plant. 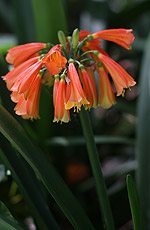 The first named clivia species, after the Noble ‘Lady Clive’ in 1828. And indeed the flowers do have a sense of nobility, a well formed flower head of this species is as beautiful as any of the modern hybrids. C.nobilis can be propagated from seed or by division. From seed it may take 7 or more years to flower. Growing conditions and care are similar to other species. A well drained soil in a shaded position, or consider growing in pots or containers as a specimen plant. Strap like foliage and flower colors ranging from the well known red with green tips through to cream a few named cultivars are around, East London Red and Pearl of the Cape are two.